Sitting on a makeshift chair created from a pile of books in a room that’s entirely too small to accommodate the seven people in it, I waited patiently for my turn to arrive. After what seemed like an eternity, I was finally passed the Gamecube controller and was ready to smash some fools. Between the laughs of jubilation and the sighs of utter defeat, the thing that I remember most vividly was winning a 2 v 1 against two of my especially loud friends in a money match. It was the toughest $10 I ever made but naturally, I would never tell them that. Despite my many fond memories of Smash Bros Melee, I must admit that I played very little of its successors, Smash Brawl and Smash Wii U. It was most likely the environment that I was in, as by that point, it became difficult to get more than two people together at once. However, given some new circumstances with work, I now find no shortage of willing competitors ready to throw down. Given such a golden opportunity, I thought this would be the perfect chance to dive head first into all things Smash with the release of Ultimate for the Switch. The opening cinematic is a large slice of fan service heaven. While I did play the previous two entries of Smash, I did not do so in any significant length to be able to compare the titles in a meaningful way so I’ll approach this game mostly as a standalone title. To those unfamiliar, Super Smash Bros is a series that pits characters from Nintendo IPs as well as various third party guest characters in a fight to knock the opponent off the stage by increasing their damage %, making them more susceptible to being knocked around. Even though there is also the option to play with a more traditional fighting game rule of reducing a character’s HP% to 0, I find that most people don’t play with that rule set as the game’s various mechanics have been designed with the off stage KO in mind. After booting up the game for the first time, I was disappointed to see only a handful of less than ten characters were available, but as I continued to play both the Versus and the Adventure modes, I was unlocking new combatants left and right until after about 15~ hours of gameplay, I had unlocked all of them. 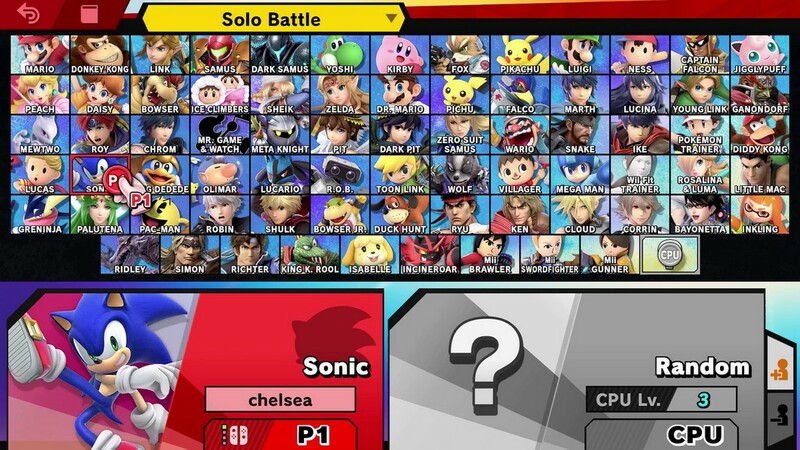 The full playable roster of over 70+ characters is absolutely massive and it was enough to make my head spin thinking about who I wanted to learn how to play first. Personally, I found myself using the bigger, heavier characters that packed a punch with each of their attacks like the mercenary hero Ike and the calamity of evil, Ganondorf. Then again, after dozens of hours played at this point, I find that I can use half of the roster with some measure of success. This roster is approaching Mugen levels of ridiculousness and I can’t wait to see it grow even bigger. One of the main selling points of the Smash Bros series is the easy to grasp control scheme, and that tradition continues in Ultimate with only two buttons being associated with offensive moves along with a third option to grab. Holding a direction and attacking yielding a tilt attacks, aptly named as when one gets juggled by that fourth up-tilt attack, they will most likely be tilted. Tapping a direction with the attack resulted in a smash move which often dealt more damage but often times took longer to come out and slower to recover. The same applied for the special moves except there was no smash/tilt variations minus a few cases. As the enemy was able to guard against my attacks, I could predict this by dashing up to them and throwing them, and given throwing was one of the fastest ways to punish certain blocked moves, I became quite familiar with switching back between all of my offensive options. While Ultimate is certainly easy to pick up and play without much difficulty after at least figuring out that generally, Up-Special will help get you get back to the stage, it’s very difficult to master as there are a slew of mechanics that hide just beneath the surface to welcome those who are willing to put the hours into figuring out what each of the characters are truly capable of. I don’t ask you to believe me on blind faith, I encourage those interested to check out the high level competitive players in action and it’ll become abundantly clear that there’s more to Smash than meets the eye. The adventure mode is long, longer than I expected anyway. As for the single player content, the Adventure mode that begins with all the heroes except for Kirby being captured and it’s up to him to free his friends and well, bring balance to the “Nintenforce”. It’s a silly set up but in reality, it’s as good as any to set the stage for such a wild crossover of characters. Journeying around in a large over world, I was able to move to different nodes which would have me fight under a particular rule set, and when victorious I was rewarded with a spirit or sometimes a new playable character. The new combatants could be used immediately and the various spirits could be assigned as a load out to increase my Strength and Defense as well as offer a slew of special functionalities like the ability to triple jump or use the ultimate smash super twice in quick succession. There are over 700 spirits to collect in all, and once I saw the full list of spirits, I was happy I wasn’t a completionist. While the adventure mode offers up some challenging fights, I found that it lasted a bit too long, overstaying its welcome as by the time I was whisked away to another large over world map, I was just about ready to done with the whole thing. Outside of the adventure mode, the classic mode filled the spot for an arcade experience as there were a few stages to tackle which changed based on my fighter of choice and challenging myself to get that 9.9 intensity by the end was more difficult and fun than I expected. I also spent an unhealthy amount of time in training mode trying to find true combos and option selects off the most common scenarios. There were some other modes as well including gauntlet types of matches and the spirit board where I could get more spirits, but I didn’t find them too interesting and stuck mostly with Classic and Smash for the most part. Lastly, I was able to test the online multiplayer after signing up for a year of the Nintendo online services, and contrary to what many others have claimed, I found it to be serviceable. Most of the time, I got into matches with the rules I specified against players that had fair connections. Of course, there were those cases where I ended up against someone who kept freezing and desyncing, rending the match nigh impossible to play but those were infrequent. Given I have a rather extensive amount of experience playing fighting games online, I never expect it to be perfect so this more or less fell within my expectations for Nintendo. However, given that online multiplayer is now a paid service, I was hoping for an improvement which I did not see. The online worked fine for the most part even on Wifi for me. However, it’s worth noting that my Wifi is notably stable and it’s probably best to pick up the hard wire adapter if the plan is to play a lot of online multiplayer. Fun Tidbit: Speaking of content, unlocking the HUNDREDS of songs from the various game series featured in Ultimate to listen to during play was a blessing. Review copy of game provided by publisher. Jae has been a gamer ever since he got a Nintendo when he was just a child. He has a passion for games and enjoys writing. While he worries about the direction gaming as a medium might be headed, he's too busy playing games to do anything about it.